Due to the lack of motorcycle jackets made specifically for ladies, in the past, a selection was made mostly based on what came the closest to fitting properly. 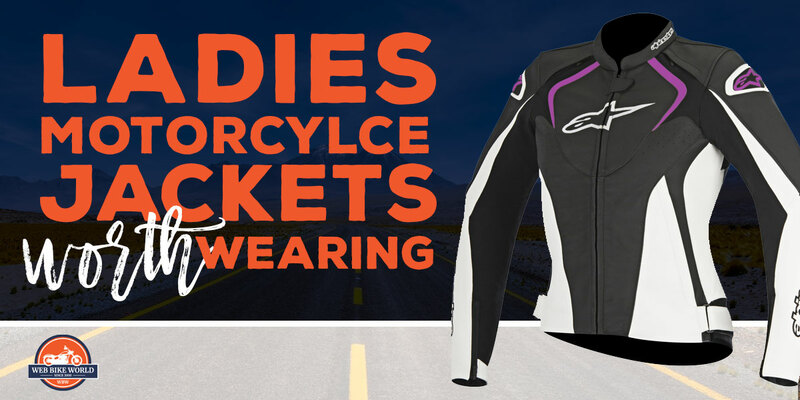 But with the huge influx in ladies on bikes, manufacturers have spent millions of dollars designing and creating motorcycle jackets and full lines of apparel that are sized and cut to fit the variety of sizes and shapes that set the ladies apart from the men on bikes. Now ladies are facing a few new questions, and I hope to provide some helpful information on the choices out there and a few of my favorite selections. With all of the amazing choices out there, many ladies are almost overwhelmed when it comes time to select gear. Some of the first questions that need to be answered are what is the piece of gear going to be used for, and what type of protection is desired from the gear. In this case, we are speaking only of motorcycle jackets, but the questions are the same for pants, suits, gloves, footwear and even gloves. Different materials each have their own benefits, and in some cases drawbacks depending on how they will be used. The three main categories for motorcycle jacket material are leather, textile, and mesh. 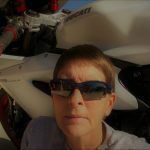 I want to take just a few moments to describe and explain how quality motorcycle jackets are purpose built and how to determine which material is going to be the best fit for your needs, riding style and the environment that you will be facing. Leather is known for its durability and ability to stretch and mold to form fit. As you might have guessed, the thicker the better for protection, but that thickness can require a longer break-in period for the leather to become soft enough to contour to your body. The other benefit is that leather in a large single piece is very durable. The thread is going to be the weakest material in a jacket and therefore the less thread the stronger the overall jacket will be. Using single large pieces of leather will create a jacket that is less likely to shred or tear in the event of extreme abrasion such as sliding on the asphalt. And not everyone knows that all leather is not created equal. Cow leather is considered to be strong, but kangaroo leather is both lighter and stronger. Tests have found kangaroo to have ten times the tensile strength of cow leather. The downside of leather is that it does require some care to keep the leather soft which helps to avoid cracking. It can also be tough to keep leather as weather resistant as a textile jacket, so rain and snow are not optimal for any type of leather. And finally, there is a definitely noticeable weight to leather which can become a nuisance in warmer climates. Some manufacturers are offering perforated leather which does provide some airflow, but it is still very warm in hotter and more humid climates. Textile jackets are man-made materials which are, in this case, designed to be durable and versatile. The fibers can be created with a number of features in mind. Durability and strength are always critical. Kevlar is a common fiber that is blended with other fabrics to create a very strong jacket that provides superior abrasion protection. Another benefit of textile fiber is that it can be treated to provide excellent protection from the elements. Rain and snow protection, as well as the ability to block out cold wind, provide a huge added value for riders in a four-season environment. Textile jackets are also very easy to maintain and clean. They are less susceptible to damage from being worn in the rain or snow and can be easily hosed off or sprayed off when they get dirty or smelly. On the downside, unless the textile jacket that you are considering specifically states that the material includes Kevlar, then it won’t be as durable as leather. Many of the less expensive textile jackets do not include Kevlar and should not be considered as safe as the more expensive options. You really do get what you pay for when shopping for textile jackets, so invest in the best level of protection that you can afford. Mesh jackets are an adaptation of textile jackets, but one that is purpose-built for a very hot environment. I am including these because living in Phoenix, these jackets are critical in the summer months. The jackets have large panels of mesh which provide awesome airflow, but they offer very little protection in the areas constructed of mesh. What you really get from these jackets is a means of protecting your skin from the sun and a way to get some armor protection in the event of an accident. I see too many riders in Phoenix in the summertime with nothing but a t-shirt on their upper body. This is not only going to lead to catastrophic abrasion injuries and burns, as the asphalt is about 150 degrees Fahrenheit or more, but also serious damage from any impact like broken bones and crushed extremities. But a quality mesh jacket will provide some very durable armor and textile panels with Kevlar to protect the back and shoulders in the event of a slide or impact. Understanding the design differences between men’s jackets and ladies jackets can be very helpful as you begin to shop for a jacket that really fits your body well. Obviously, there are many different sizes and body shapes out there, but in general, ladies jackets will differ from men’s in a few specific areas. Men’s jackets are cut fairly straight but the ladies jackets offer a more defined hip, waist and bust area. This allows for more flexibility and comfort across the shoulders and across the bust when the jacket is fully zipped. The sleeves in a ladies jacket are cut shorter than men’s sleeves and are surprisingly bigger around. And the shoulders are more narrow and less square on the ladies jackets. All of these features will provide a more comfortable fit for the ladies and will make long rides much more enjoyable, as there are not tight areas that reduce circulation or areas that pinch or bind when you move. 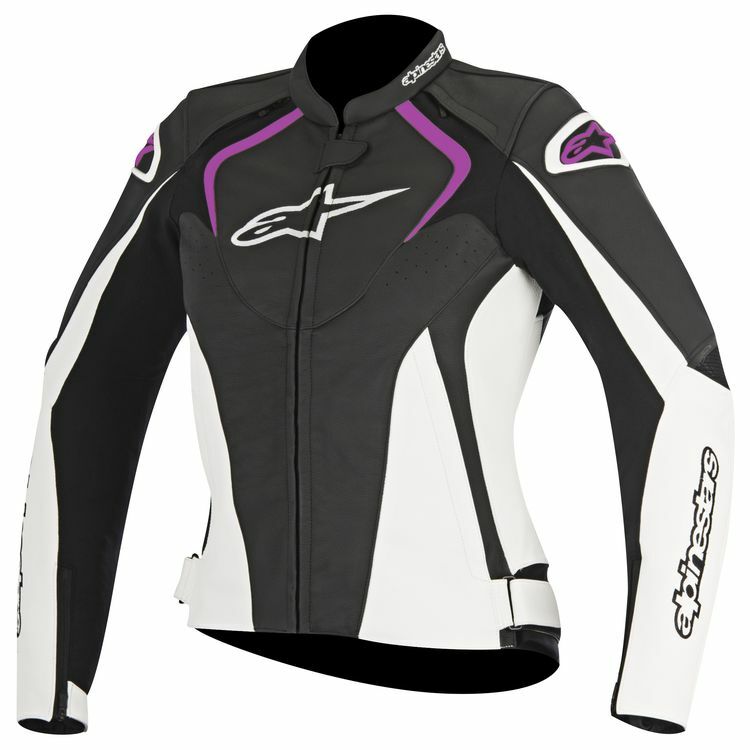 The Alpinestars Stella Jaws is a leather jacket that will work equally well for a day at the track or just a day out enjoying a ride and looking sporty. This jacket is designed to be form-fitting, but the great part is that it has several adjustments so that ladies can really achieve a comfortable and safe fit. 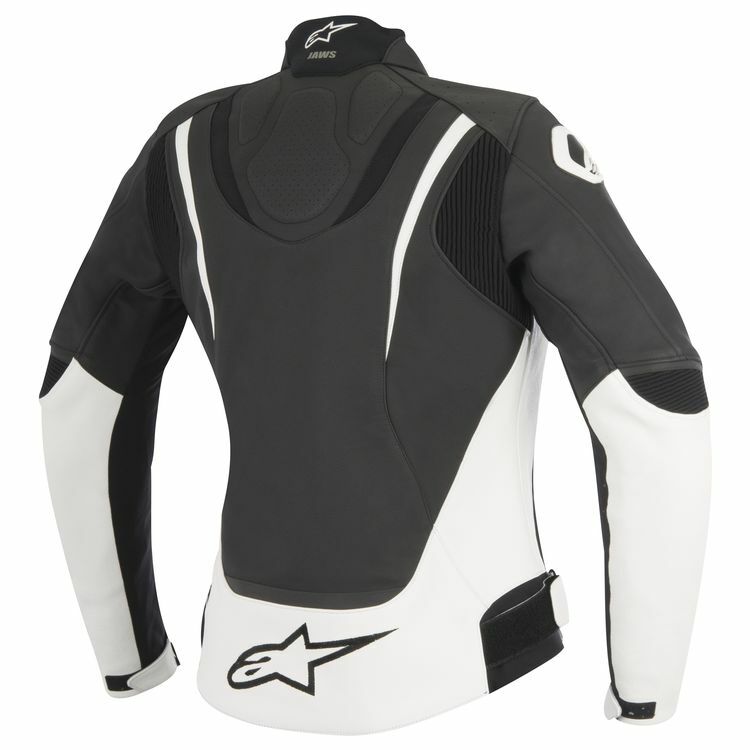 As for the safety features, this jacket is cut from 1.2 to 1.4 mm cowhide leather and offers CE Bio Armor in the shoulders and elbows and includes pockets so that you can add Nucleon series CE Level 2 back and chest protectors. I have found it to be very common for even high-end jackets to require the added purchase of chest and back protection. This allows for more personal choices about safety level and comfort level and should not be seen as a drawback. 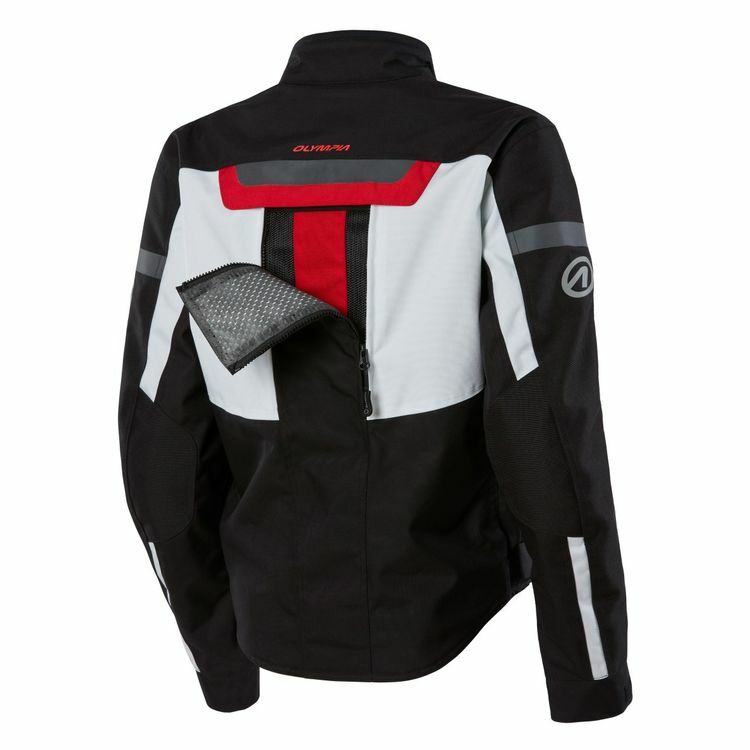 What is really great about this pretty much race ready jacket is the added features for rider comfort. The back of the jacket has been designed with poly fabric stretch panels near the shoulders to provide a full range of motion with no pinching or gouging into your arms or shoulders as you move. There are also accordion insets at the elbows for added comfort and flexibility. A critical fit area for all ladies is at the hips. This jacket accounts for a variety of hip sizes with VELCRO brand D-ring waist closures to customize the fit. The same great closures at the wrists allow for a custom fit regardless of the size and type of gloves that you may be wearing. In short, the Stella Jaws leather jacket offers ladies all of the same protection that is offered in the men’s jackets but with the shape and adjustment options that are critical to a safe and secure fit on a woman’s body. At about $500, this jacket is in the higher price range, but for ladies who want to ride fast and look great while also being well protected, this is The Ladies Leather Jacket Worth Wearing. The Olympia Expedition is a textile jacket that can accommodate all four seasons with the comfort and flexibility that ladies have never really had before. With the ability to wear one, two or three layers, this jacket can handle everything from warm summer days to fall and spring rain and even winter temperatures. The outer shell is made of 500 and 1000D Cordura for great abrasion protection and also includes a Mega Vent Panel System to allow for more airflow when needed. Layer two provides the rain gear protection, and layer three offers thermal protection for even the coldest rides. But it is the protection from injuries that make the Expedition a real favorite among the ladies. The CE level 2 elbow and shoulder armor are removable and can also be replaced or upgraded, as can the CE level 2 back protector. This gives riders a nice level of protection to start off with and at a reasonable cost. Then you can upgrade or make changes after you decide what will work best for you. 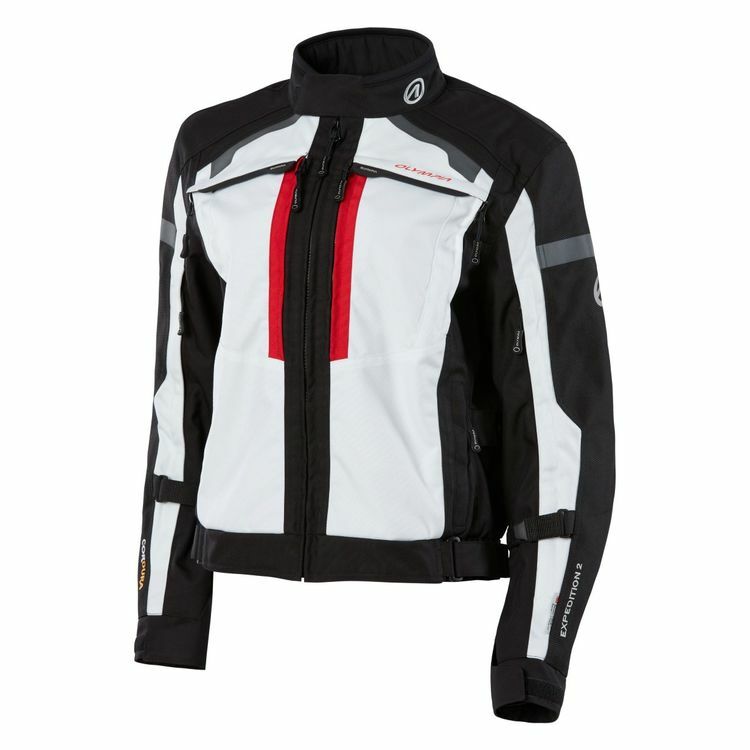 The comfort features in this jacket start with the tailored hourglass shape and design to meet the needs of almost any female rider. The ability to adjust the fit of the Expedition is thanks to the D-ring adjustments not only at the waist and cuffs but also at the elbows and collar. This lets you customize the fit regardless of the weather and clothing that you are wearing under the jacket. One thing that could stand out about this jacket is that it does not offer the gussets or accordion panels that the leather and mesh jackets did. But this is due to the cut of the jacket. Being a four season jacket, it is cut a bit more generously and is not as form fitting. For that reason, it really does not require the same insets for flexibility. This jacket will always have a slightly less snug fit and, it will very easily accommodate an assortment of shirts, sweaters or sweatshirts without becoming tight or binding. At close to $500, this jacket is somewhat of an investment, but the cost really is not that unreasonable when you think of it as replacing two or even three other jackets to meet your needs year round. This one and done feature, as well as the safety and comfort, make this one of The Ladies Textile Jacket Worth Wearing. 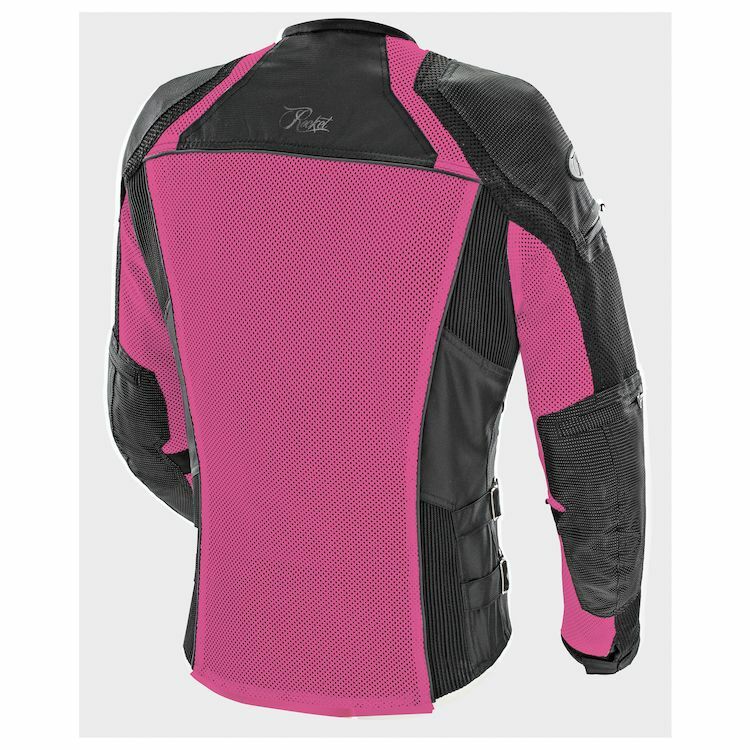 The Joe Rocket Cleo Elite is a mesh jacket that is going to meet your needs for protection and airflow when you are riding in a hot climate. This racing style jacket is small and lightweight for the hottest days of the year, but it can also be worn with the waterproof and windproof liner for less ideal weather. And you can add the insulated vest when the temperatures are starting to drop. But what really makes this mesh jacket stand out are the safety features that are tucked in around all of these mesh panels. First, the Dynax reinforcements on the upper back, ribs, and forearms provide added abrasion protection in the event of an accident without eliminating the awesome airflow of the mesh panels. The CE approved shoulder and elbow armor inserts are accessible from the outside of the jacket and can be removed or replaced as needed. And the back protector included with the jacket is dual density and can be removed or replaced to meet your personal desires for comfort and protection. The comfort features on this jacket are equally as important as the safety in my mind because if a jacket is not comfortable, you are not going to wear it in the really hot weather of the summertime. The Full Flex articulated back and hip expansion panels allow this jacket to snuggly fit the shape of your body without gouging or riding up when you lean forward. These panels also allow for full range of motion and the ability to change your riding position easily to avoid numbness or muscle stiffness on a long ride. The jacket also has a full 8” connection zipper if you choose to pair the Cleo up with pants to provide even more protection in hot weather. And finally, it doesn’t add to the safety or the physical fit but the four color options make this a great fit for your personality. Riding in gear that fits great and makes you happy is the best way to stay focused and safe on your bike. All of these great features in one jacket make this one of The Ladies Mesh Jacket Worth Wearing. The market for ladies riding apparel is finally changing to keep up with the increase in female bike owners and riders. 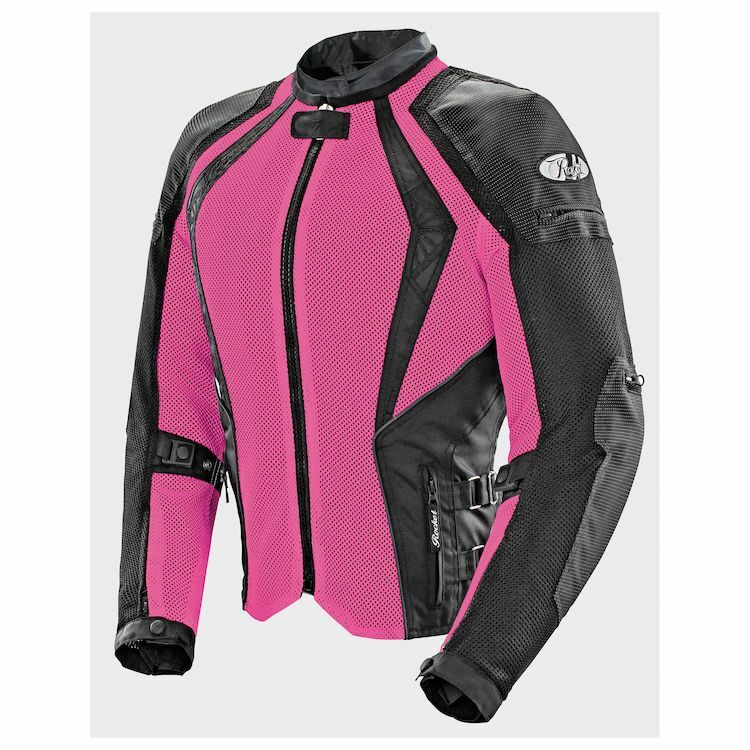 With more options becoming available each day, and a little research and time, every lady who rides are certain to be able to find the perfect gear for both safety and comfort. The only mistake that ladies can make now is not investing the time and money in great gear. To see what a difference quality gear can make, check out The Aftermath of Crashing with No Gear vs. All the Gear here at WebBikeWorld.